get in on him. The shot was 120 yards. He had both antlers at the shot and then he got back up with only one antler. After gutting him we put him in the meat wagon and the second antler shed off. She is a huge fan of the European Mount look. My question is how do I re attach the antlers to the skull? Glue? What kind? 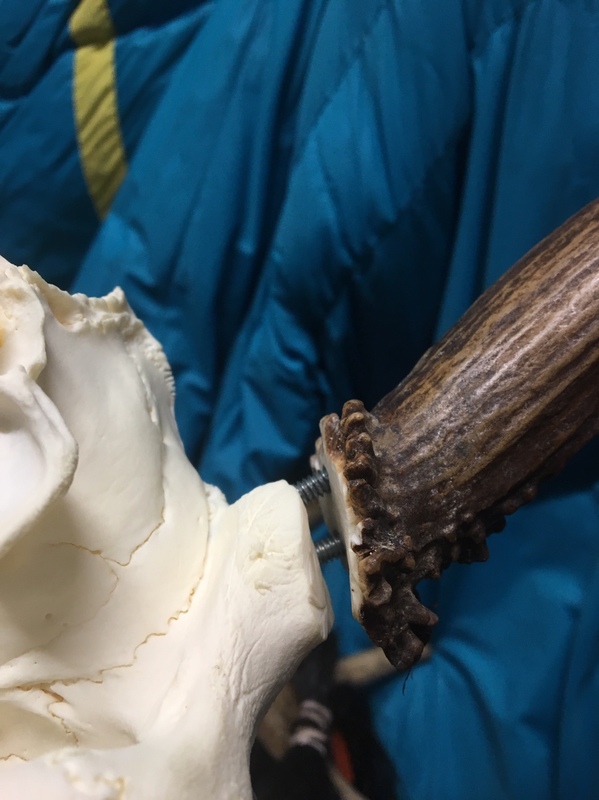 I have never done it, but I have heard of people drilling into the skull and antler and inserting a dowel/rod and epoxying them in place. The difficult part would be trying to drill it at the right angle so the antlers are in the right position when assembled. Epoxy WITHOUT THE DOWEL should do the trick. Maybe we're not on the same page, but to do this with enough epoxy to be strong enough (he did say it was a pretty good bull) and not have it seen all over the rest of the skull of the EU mount, I think would be difficult? If he maybe wanted to wrap leather around all that epoxy, then maybe I could see that happening? Sam....taxis do it all the time, usually with steel square receivers and dowels, but of course most the time they already have the skull plate attached so it's pretty straight forward. Like anchskier said, getting them lined up to drill would be the tuff part. But as long as you could somehow get them braced off and stable where you want them while drilling the holes, epoxying the square inserts and dowels, (which also have to be lined up) "shouldn't" be that much of a problem???..... (easier said then done....eh?).....lol. Here is the right way to do it for long term enjoyment. It is way easier to clean the skull with no antlers attached!! So you are lucky there! Clean with maceration or beetles and degrease properly. Whiten if you prefer. Seal if desired. With caribou antlers they are not that heavy and generally protrude up, as opposed to moose to the side. Much less force spreading them apart. You need to Drill two holes in the skull on each side and 2 in each antler. Two holes make it so the antler doesn't spin. I used small all-thread 1/4-3/8" to attach caribou/deer. Moose you need bigger square stock to attach antlers. Make your holes on skull and antler large enough where it doesn't have to be perfect/exact fit/alignment. Dry fit the all-thread and antler together to make sure it will mate up nicely. Once dry fit looks good, tape off around skull and antler for glueing. 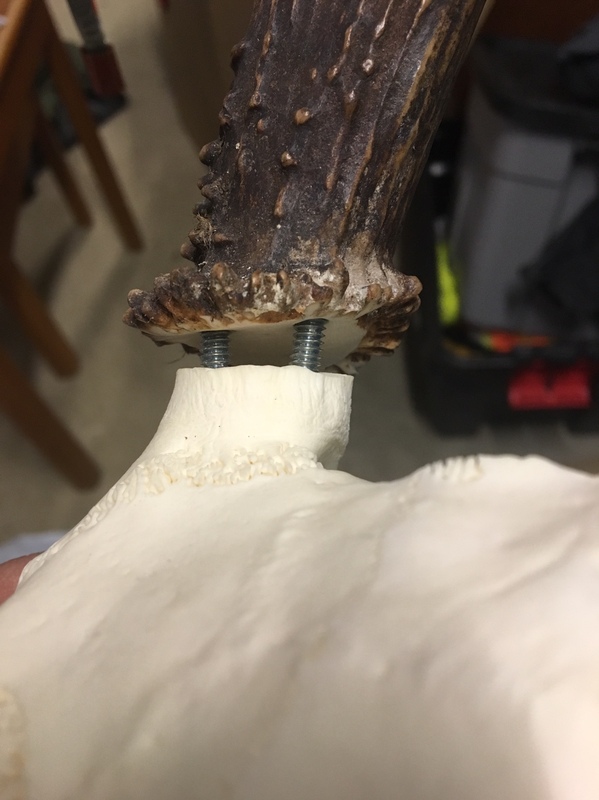 Clamp/secure one antler with pedicle up. Take some bondo (pint sized can from automotive store with fiberglass reinforcing) and mix the Hardner together and place inside skull and antler (quickly). Install the all thread and put skull on and align antler. Hold skull in place until bondo sets( few minutes). Repeat opposite side to get antlers lined up and looking good. Once done remove tape and any overflow bondo. Apply 2 part clay (apoxie sculpt) to antler/skull joint if desired/needed. Paint joint with acrylic paints mixed/match to blend in with skull. I have done the same thing with one exception, its near impossible to get one antler in the right place if doing it one antler at a time. If you do them both at the same time, while the epoxy is still soft, you can get the antler orientation, overall spread etc. right. The key is not trying to get perfect alignment of the hidden dowel pins. Instead, make the holes for the dowels large enough so that there is some movement to allow you to align everything before the epoxy sets.
. Moose you need bigger square stock to attach antlers. Are we taking about making the holes in the skull oversized or the holes in the antlers oversized? Funny thing is mine lost one antler but still has the other. He had both when I shot him. Of course that's what they sell in the taxidermy supply catalogues for removable antlers. A skull cap and drilling for removable antlers is way easier. You drill from the brain side not the antler attachment side. Alignment is perfect every time with the removable. You cut the antler off after inserting and glueing the square stock! Both skull and antler oversized Tibet alignment right. You put the bondo/epoxy or whatever glue in both oversized holes for metal rod/square size of choice. 4 small holes per antler side total for rods/dowel, or 2 total per side for square stock. What we are talking about here is a European mount with the antler already off. In this case it isn't possible to drill from the inside of the brain pan. I know you are talking about a euro and reattaching the antlers. Alignment is the difficult part of this project. That's why you use 2 smaller rods in over widened holes. The other guy I quoted talked about his taxidermist using square stock on moose and caribou. That is most likely for removable antlers on mounts. - way easy drilling through the brain side. A single Square stock is possible on a euro also though. Square help it not rotate like 2 small round. Here is a blacktail with the two rods inserted into the skull and antlers. The antlers also came off. This hopefully help you to get a better idea of what was being discussed. So in the pics pics to that point you haven’t added any epoxy or anything yet. The pics depict a “dry fit” so far? Correct, pics are just dry fit. Next step would be glue/epoxy/bondo. After antlers are good and set them come back with apoxie sculpt to fill the gap.